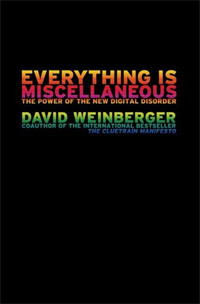 A week or two ago I received an advance reader’s copy of David Weinberger‘s Everything is Miscellaneous, due to be published in May. Over the next four months I’m going to be mentioning Weinberger and his book a lot, culminating in some sort of “real” review timed to the release date. In subsequent posts I’m going to spend some time exploring Weinberger’s ideas, drawing mostly on his many talks, some of which actually map to chapters of his book. But I won’t cite the book a lot. I once managed to review a Hollywood movie long before its release date, and wound up the first review online. *** But I think ARC etiquette dictates I hold off. Someone tell me if I’m wrong. If you haven’t heard any of Weinberger’s “preview talks” to Everything is Miscellaneous, I’ve provided a guided list to all I’ve seen online. They differ a good deal, but clearly partake of a single Platonic talk. *And LibraryThing briefly and—very distressingly—wrongly. I’m going to see if he can at least eliminate the error. **I thank Weinberger for finally giving me something to say about Heidegger at cocktail parties while allowing me to remain unsullied by his impenetrable prose and political villainies. ***My review of Oliver Stone’s Alexander the Great. ****Full disclosure: Apart from asking for and getting an ARC, I have nothing to disclose. He’s never bought me a beer and I don’t owe him money. He once let me look at an essay he was writing, and I made pedantic objections related to Greek oleiculture. I ate some free food at one of his talks, but I don’t think he paid for it. See the post on the main blog.